Not to have a pity party, but I was down this morning. In kickboxing class the teacher started speaking English to me after she told the class something in Spanish. That was nice of her because I hadn’t understood all she said. But truthfully, I was in denial, deflated and keenly aware that I stick out. I stick out: I hadn’t opened my mouth yet, so she couldn’t have heard my accent. She asked the class a question, which I did understand, and I nodded. So she knew I could understand a little. I looked in the mirror. Guess I don’t look Puerto Rican. (we knew that). Later she told me she was excited to practice English. Which is understandable. And I’m flattered to help. But it simultaneously robs me of an opportunity to practice and shows me that her English is better than my Spanish. It still takes me SO long to switch gears into thinking and speaking Spanish, I’m usually 2 minutes behind on every conversation. Every sentence needs to be carefully crafted and rechecked in my head before I spit it out. Usually. I can speak in the present tense pretty well with words I use a lot. I’m probably like my Dad. For years he claimed he wasn’t a fluent Spanish speaker and then I’d hear him praddle off in Espanol and be amazed. I’ve had locals here tell me my Spanish is great. I’ll keep their praises in mind when I’m hard on myself. 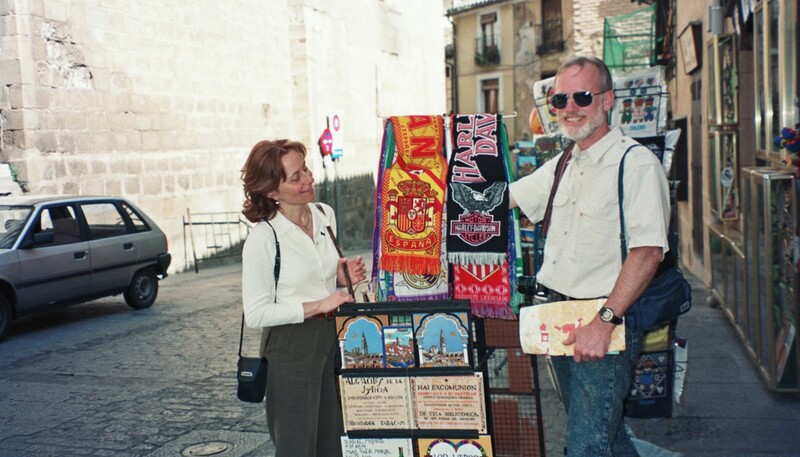 Dad in Spain, in 1998. He’s spoken fluent Spanish my whole life. Last weekend I met a lady who’s lived here 41 years and still doesn’t speak Spanish. To each her own, but I would seriously regret that. I can’t stop pushing myself in all areas of life. Before everyone makes encouraging comments below, I’m just having a moment, and I’m fine. Everyone gets frustrated. I’m WAY ahead of where I was a year ago. Go Laura! This entry was posted in Puerto Rican spanish and tagged learning spanish in puerto rico. Bookmark the permalink. Yeah, Go Laura, you are doing fine! My Spanish is so limited so I know I will be dealing with this same issue. Keep going, you will pick up more and more! Laura, you are doing great. Give it time, you haven’t been here that long. You will learn a little bit at a time. Listen, I am Puerto Rican by birth and my Mom spoke Spanish and English to me my whole life and I thank her for that. My dad only spoke Spanish and some broken English and they both got along in the work force. We made the mistake of not speaking Spanish to our kids and now they understand some of it since my inlaws only spoke Spanish. they all took it in school and never mastered it since we lived in NY, they didn’t need to. Now our grandson, who is living with us and doesn’t speak it either( it is probably my fault since I didn’t teach his father) and he is in his senior year of public h.s. and I know that it has been a bit difficult for him since he doesn’t know the language but he has made many English speaking friends(who I tell to speak Spanish to him) and he did pretty well last year in school. It seems the teachers make concessions for the non Spanish speaking students and help him out. At least you are making a big effort, he is not, we have tried teaching him but he is very stubborn and so he has to learn if he wants to go to college here or get a job. My point in all this is that even though I speak, read and write Spanish, sometimes, believe it or not, there are some words used that I have to look up the meaning, because they are foreign to me and I have no problem asking people what they mean(that is how you learn). I was helping my grandson with some homework and had to look up many words that I didn’t understand. Ask for help and they will help you when they see that you are trying. I saw your facebook post and started reading your blog and this is so much like the experiences I had there. I was trying so hard to get better at Spanish and it was so hard. I felt that every time I walked out of my house everything was a struggle. I always felt like I had to fight to try to speak Spanish, and everyone would try to speak to me in English. People would always switch to English and it felt like a personal attack because I wasn’t good enough yet. Then if people stayed speaking Spanish I would inevitably become embarrassed because really I wasn’t good enough/fluent enough and I couldn’t understand everything. Either way I seemed to end up feeling bad. And it sometimes felt like when I would try to speak in Spanish people would act offended, like I was assuming they didn’t speak English. It’s a very lonely feeling. I was so relieved when Marco (my husband now and native spanish speaker from El Salvador) came to visit me and started speaking to them in Spanish and they switched to English with him too! Anyway, just wanted to reply. If you want to practice Spanish together by writing letters or whatever I’d be up for it. My husband could proof read. I don’t know if I will ever be fluent. It’s such a hard, long road. I identify with your experience in PR a lot! Thanks Abi! Exactamente! But I have become more bold when asking my friends to speak Spanish (slowly) to me. But yes, I do feel dumb when they are kind enough to speak Spanish and I get very lost. But I know I have learned a ton, and thankfully have friends that I can practice with. No one has been offended when I speak Spanish, and several have told me that it’s very good. (hahaha). I totally missed that you got married! Congrats! I’ve been to El Salvador once. My Dad has gone at least once a year since the war. Now he helps observe elections there and support a village. Interesting place. Cool! Does your dad have any health care contacts in El Salvador?